“The work is an absolute necessity for me. I can’t put it off, I don’t care for anything but the work; that is to say, the pleasure in something else ceases at once and I become melancholy when I can’t go on with my work. This is one of our handloom workshops in Varanasi (Benaras). 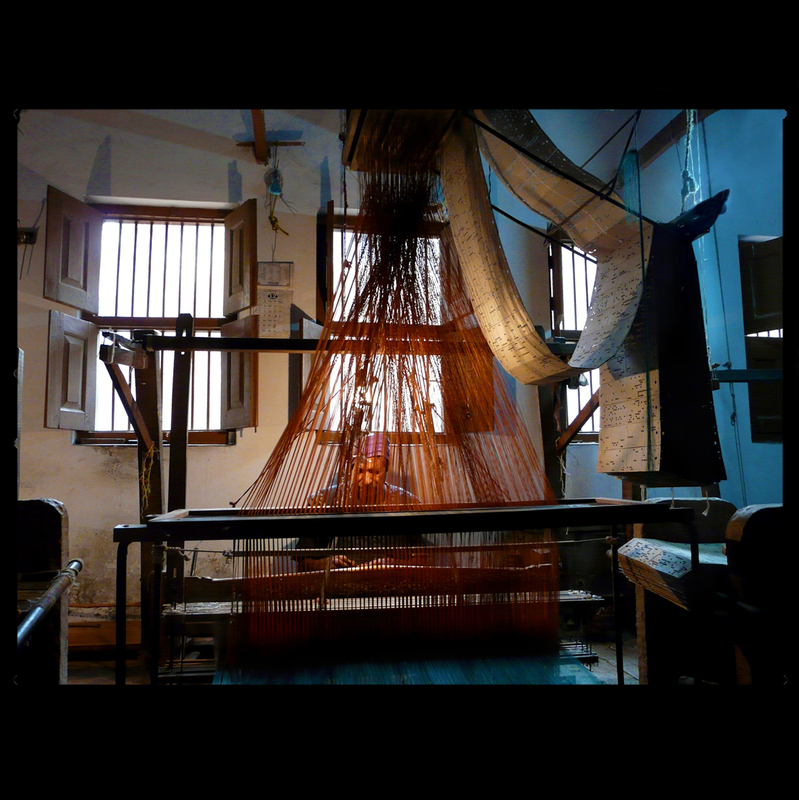 Varanasi weavers have to struggle with many issues since the industry collapsed fifteen years ago and half the workshops of the city had to close. RED HALO has settled a program in order to help a few of them, it is a drop in the ocean but in our humble and limited way we are trying to maintain a few people to carry on this amazing heritage which remains in the Eternal city. This blueish tone of light green is called turquoise, the name comes from the French for Turkish. 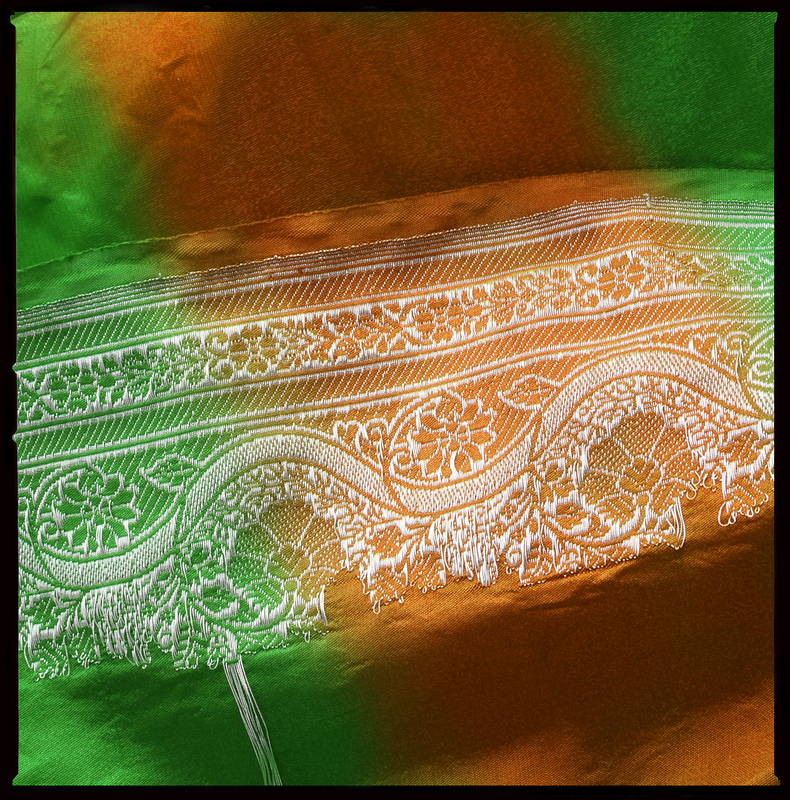 This friendly and happy color is worn by many people in India. In color psychology, this shade controls and heals the emotions creating emotional balance and stability. It is a combination of blue and a small amount of yellow and it fits in on the color scale between green and blue. It radiates the peace, calm and tranquility of blue and the balance and growth of green with the uplifting energy of yellow. Turquoise recharges our spirits during times of mental stress and tiredness, alleviating feelings of loneliness. Being the mid color between the extremes of red and violet, it is the color of balance, for the emotions, thoughts and speech. Turquoise is calming yet invigorating, restoring depleted energies, it enhances the ability to focus and concentrate, assisting with clear thinking and decision-making, and the development of good organizational skills. This shade also represents open communication from and between the heart and the spoken word. It relates to the electronic age and the world of computers, and communication on a large scale. This picture was shot in a little workshop in Varanasi (Benaras) held by a Muslim family who manufactures several fabrics for Red Halo. 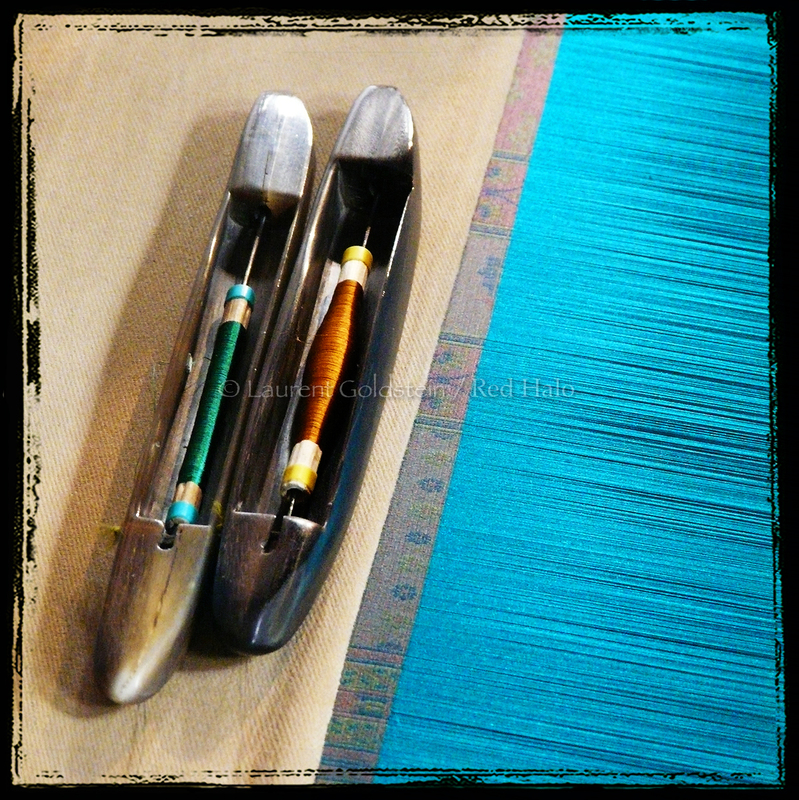 Those turquoise threads are used in order to weave a traditional silk brocade on a handloom machine. 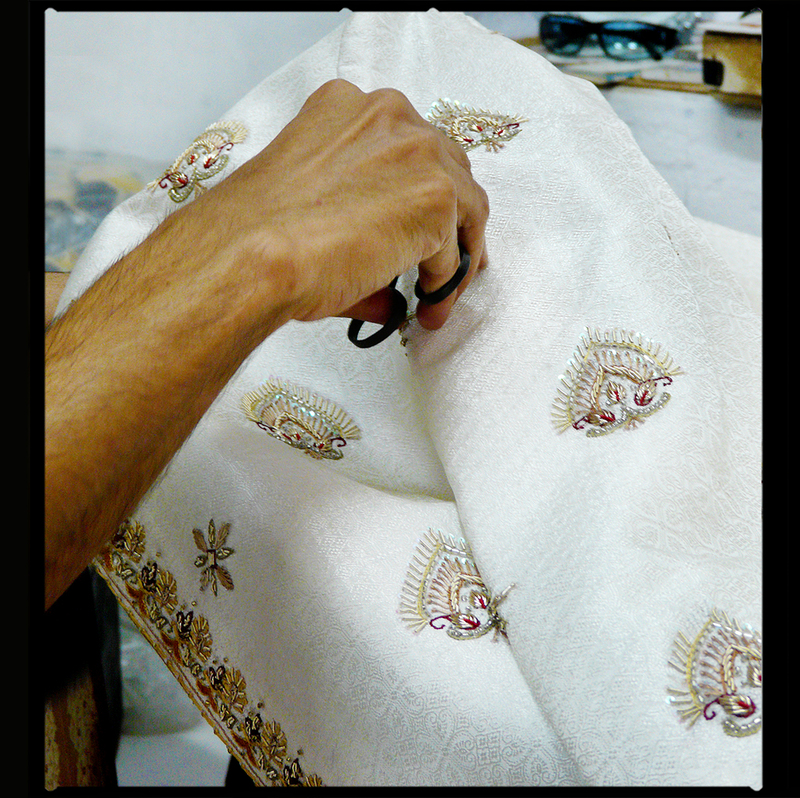 This traditional artcraft transmitted from generation to generation contributed to the fame of the oldest living city in the world.RED HALO is a collection of household linen based in Benaras (Varanasi – India) providing work to people who were living with difficulties and education to children. 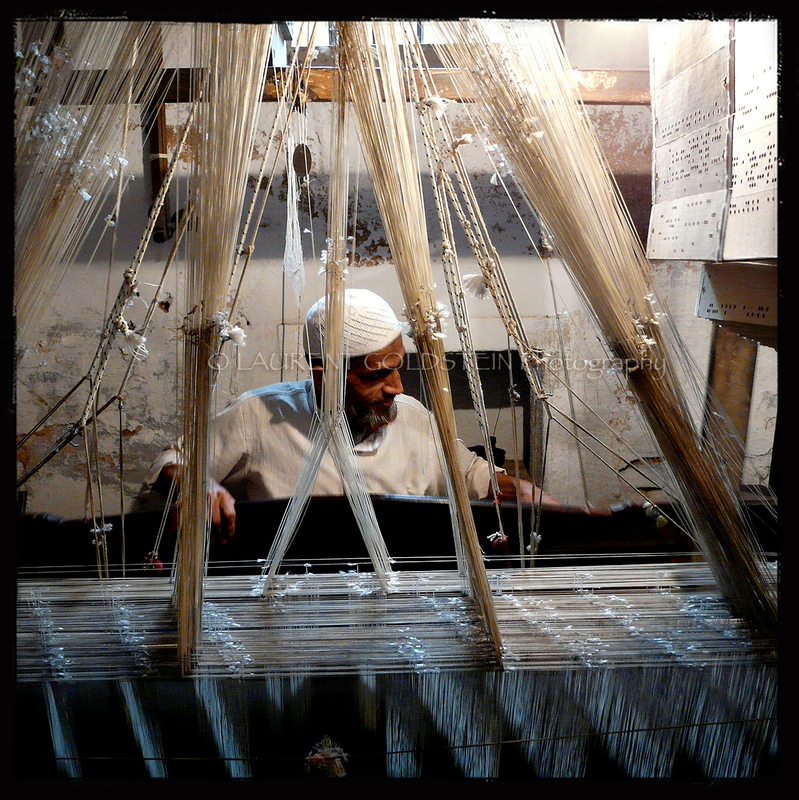 This is a handloom in one of our workshops in Varanasi (Benaras). The warp threads pass alternately through a heddle and through a space between the heddles (the shed), so that raising the shaft raises half the threads (those passing through the heddles), and lowering the shaft lowers the same threads—the threads passing through the spaces between the heddles remain in place. RED HALO has settled a program in order to help a few of them, it is a drop in the ocean but in our humble and limited way we are trying to maintain a few people to carry on this heritage. This picture was shot in a workshop nearby Sarnath where magicians display colors on sarees using the art of block printing. “MANY, many years ago lived an emperor, who thought so much of new clothes that he spent all his money in order to obtain them; his only ambition was to be always well dressed. He did not care for his soldiers, and the theatre did not amuse him; the only thing, in fact, he thought anything of was to drive out and show a new suit of clothes. 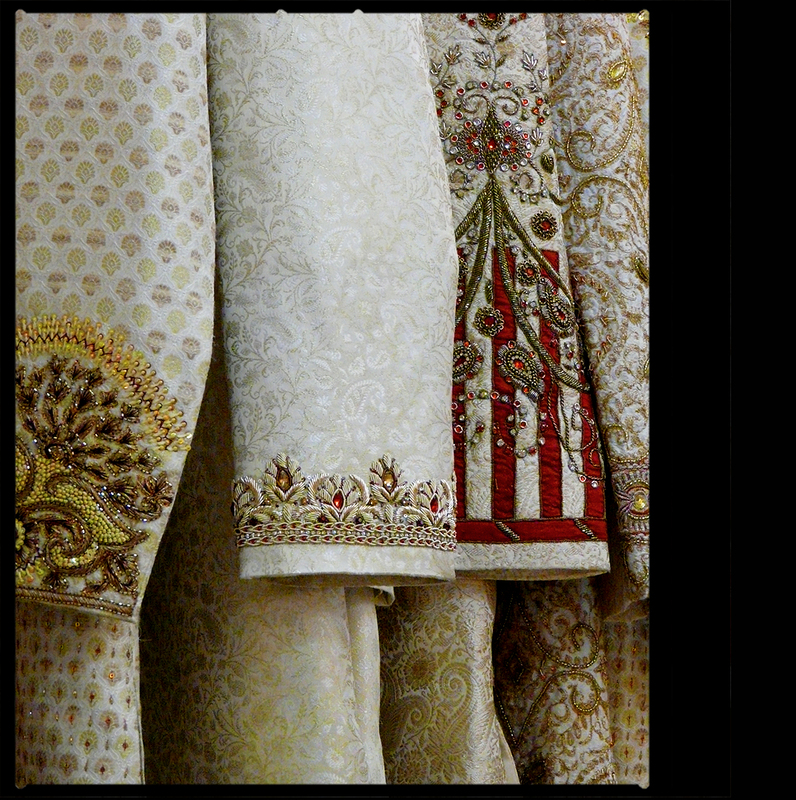 Those rich fabrics with heavy embroideries are men’s traditional garments in North India used for ceremonies and parties. This picture was shot at my tailor in Varanasi (Benaras). “Il y a de longues années vivait un empereur qui aimait par-dessus tout les beaux habits neufs ; il dépensait tout son argent pour être bien habillé. Il ne s’intéressait nullement à ses soldats, ni à la comédie, ni à ses promenades en voiture dans les bois, si ce n’était pour faire parade de ses habits neufs. Ces tissus opulents richement brodés sont des vêtements masculins portés lors de soirées et cérémonies dans le nord de l’Inde. Cette photo a été prise à Varanasi (Benares) chez mon tailleur.